What does an intellectual property lawyer with a degree in engineering and a quest to save the world do when he can’t find any tasty artisanal vegan cheese? 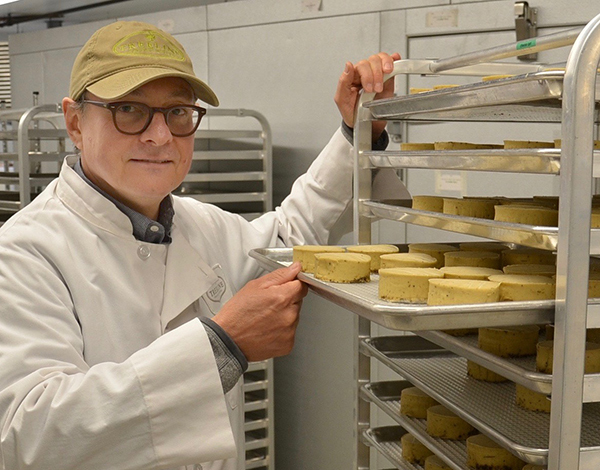 Well, if you ask Michael Schwarz of Treeline Treenut Cheese, the answer is simple: You grab a cookbook, practice through trial and error, and make your own! Schwarz’s culinary experiment paid off. Long gone are the days of making a small batch of vegan cheese in his kitchen. Treeline Treenut Cheese now enjoys wide distribution across the country, with exciting new developments in the works—all without compromising an ounce of taste or integrity. He shared with us his motivation to create his cheeses, as well as how his background shapes his business philosophy. What inspired you to develop cheese made from nuts instead of dairy? Michael Schwarz: I used to be an intellectual property lawyer and traveled a lot for work in Europe. I had clients in France and Italy, and I loved the artisanal cheeses there, but once I became vegan, I really missed them. I decided to create a cheese that would satisfy my own taste, while keeping with my own values. What made you choose cashews as your nut of choice? MS: I chose cashews because they have a lot of fat, the “good” fat, and have a very mild flavor. Cashews don’t give off a nutty flavor like almonds or hazelnuts that have very distinct flavors. Cashews are also great for culturing. Also, one thing that makes Treeline stand out is that we don’t just extract milk from the nuts to make the cheese; we turn the cashews into a cream and use the entire nut. How does having a law background help you in terms of running a vegan cheese business? MS: I have a slightly unusually background; in addition to law, I also have a degree in engineering. I try to bring an analytical approach to the business. My engineering and law background really does help. Is there a key event or moment that led to your business’s success? MS: Going to Natural Products Expo East was a major turning point. Prior to that we were completely unknown; Expo East was a breakout for us, absolutely. Another key moment was when we acquired distribution through KeHE and Alberts Organics. This took Treeline from being just a hobby to being a real business. What do you think is fueling the rapid growth of the plant-based food industry? MS: The biggest factor at the moment is climate change and the environment. For example, people are starting to realize what a big impact the meat and dairy industry has on water consumption. Health concerns are driving a big part of plant-based foods, too. People are tired of eating foods that just aren’t good for them. And there’s also an increase in the knowledge of what goes on in factory farms and it’s starting to really disturb people. Many are deciding they don’t want to contribute to the cruelty. There are many nut-based cheeses on the market today. How do you remain competitive? When it comes to selling nut cheese, which marketing term do you prefer, vegan or plant-based? MS: I’m excited to announce that Treeline has new products making their debut at Expo East! 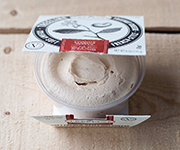 We have a premium New York-style cream cheese that you can enjoy on a bagel or in recipes, and we’ll also be launching a maple walnut cheese that’s sweet but slightly tangy. We’re also creating single-serving sizes that you’ll be able to find in meal kits like Purple Carrot. How wou ld you describe your company’s culture? MS: When I started Treeline, animals and the environment were the priority, but we also know it’s important to not forget human beings, too. Our company culture respects and values people in every aspect of the business, including where we get our cashew nuts. Unfortunately, there are some really bad labor practices when it comes to harvesting cashew nuts. We source our nuts from Brazil, where they process the nuts by machine. The conditions in Brazil are much more favorable than what’s done in Vietnam and India, where they processes them by hand. Cashews have a very hard shell that has to be broken, and it’s acidic and burns people’s hands. With hand processing, there’s always a risk of contamination, too. Nothing is perfect, and I can’t tell you that Brazil is perfect, but at Treeline, we make the best decisions we can based on the information we have. Treeline doesn’t just look at the bottom line at the expense of people. I grew up in South Africa during the height of apartheid and I saw racism and the mistreatment of people first hand. My father was a politician and, at one point, was on the defense team when Nelson Mandela was on trial. I was brought up to understand that if something is wrong, it’s wrong. You shouldn’t try to justify something that you know to be wrong, and you shouldn’t try to justify something just because everyone else is doing it. That’s really why I started the company—and that’s how I try to live my life. It’s worth more than money to me, that’s for sure.